Welcome to the American Truck n' Auto Accessories running board website where our moto is "Quality Parts & Quality Service is The Way We Do Business". 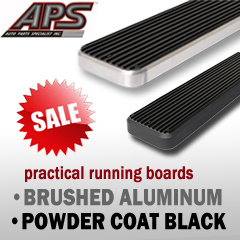 At Running Board Central, we specialize in various types of truck running boards and steps. You can enjoy one stop shopping for all your truck running board, truck steps, oval or round nerf bars, tube steps and side steps needs. Whether you own a truck, SUV or van, we offer a complete line of high quality and stylish products along with geat value that will satisfy and fulfill your needs. We also pride ourselves on top notch customers service. You get it all! Top quality products along with top quality service from American Truck n' Auto Accessories! Feel free to call us at 928-282-1916 with any questions or concerns you may have..we would love to hear from you! Running boards. Are you tired of stepping so far up into your truck you either have to visit the Chiroprator or hear it from the wife (or both)? Or maybe you took a tumble when you jumped back out of your truck and landed on a slippery surface such as snow, ice or mud. You need some running boards! Running boards for your vehicle can come in many shapes and sizes and be made from many different materials such as extruded aluminum, carbon steel and stainless steel. It can be rather confusing as to what type and style would suit you the best. This depends on if you are going for a practical application or wanting to add extra style or a rugged look, or you may be wanting both. We offer many different styles and types to choose from. Many of todays vehicles such as Trucks, SUV's, Vans and Jeeps are quite high to climb up into and can be challenging and somewhat unsafe for many of us. A set of good quality and sturdy running boards will help tremendously, providing a sure footing as you step up into or climb out of your Truck, SUV or Van. Nerf Bars are similar in many ways to running boards in as much as they also provide a secure step up for easier access and exit from the cab. Truck Nerf bars come in different shapes and sizes from 3" or 4" round and 5" or 6" oval shapes. They are available in either cab length which runs just the length of the cab or wheel to wheel which runs along the cab and under the truck bed where it meets the rear wheel. Nerf bars are generally made from high quality carbon steel for black powder coat finish or high quality stainless steel for the polished chrome finish. Round nerf bars offer a nice off-road kind of look and are relatively economical. Oval nerf bars offer a larger step area and have a nice stylish look to them. All nerf bars are generally available in either black powder coat or polished stainless steel finish. 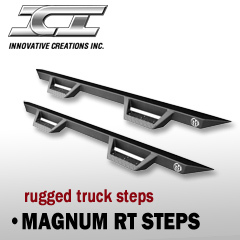 We are proud to offer the Magnum RT Steps truck steps by Innovative Creations Inc, a leader in high quality truck accessory manufacturing for over 20 years. Quality built, these amazing steps give you the combination of great looks and super tough construction which will never fail to please! ICI wanted to offer a product unique in and of itself and at the time, there was nothing else on the market quite like the Magnum RT Truck Steps. So utilizing their knoweldge and experience in truck accessory manufacturing, ICI designed and developed these truck steps and they are now among the most popular top selling truck steps available on the market today! 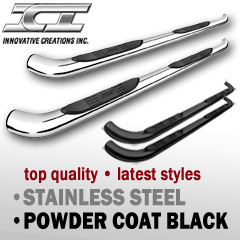 RT Truck Steps by ICI are custom designed and fitted for each individual year, make and model of vehicle. They are particuallary suited to Chevy Silverado 1500 and 2500/3500 HD models, Ford F-250/F-350 Super Duty, GMC Sierra 1500 and HD models, Dodge Ram 1500 and HD, Jeep Wrangler and Toyota Tundra and Tacoma. We now also offer the super stylish stainless steel version of the Magnum RT Steps finished in 304 polished stainless steel. There's nothing like them on the planet! Order yours today!